Greetings one last time from Montevideo. Today is my last full day in town, and is also the last report I will write for some days. Over the years, I have been on my mother´s case to visit Argentina, and she has finally accepted, and her flight arrives Saturday morning, so, for the next five days, I will be playing tour guide, first in Uruguay and then in Buenos Aires. I will write one more report next Wednesday or Thursday with final mileage totals, and a final breakdown of expenses for anyone else interested in a trip like this. Today, again, I got out my now spotlessly clean bike and went for a ride about town. Again, it was extremely hot, although that has now changed and it is raining. For the heck of it, I rode down to what was, once upon a time, the General Artigas central train station. This structure is an absolutely huge, neo classical building that looks like a London train station, and is probably a copy of a London train station. It is also, like most of the Uruguayan rail system, in complete ruin. Following my ride, I went and picked up my rent a car that I am going to use for the next couple of days, and got a long lecture about not leaving ANYTHING, especially the face of the stereo, in sight when the car is parked. It was even suggested that I leave the glove box door open, so any potential maggots will know without breaking the window that there is nothing to steal. I then, for the first time in 35 days, actually drove something other than a bicycle, and took it to the garage behind my hotel. I then wandered about Ave 18 de Julio a bit. Montevideo (The name supposedly comes from an old Spanish map, where what is today Plaza Independencia was marked as "Monte VI de EO", meaning the "sixth hill" "from" "East to West".) is composed of a port area on the point of land that sticks out from the city itself. The port is very big and very modern, and could, if the country had a functioning rail system to move freight around, especially into Brazil and Argentina, be very busy. Unfortunately, about the only thing that really functions in the railroads is the union, which makes very sure to prevent any privatization or foreign (read Brazilian) investment in infrastructure. As it is, there is always a line of trucks with Argentine and Paraguayan plates waiting to get in and pick up containers. Next to the freight port is Navy headquarters, and the Buquebus passenger terminal, from which we will depart for Buenos Aires in a hydrofoil on Monday. Across the street from the passanger terminal is the "Mercado del Puerto", which is basically a tourist trap, but a very nice one, full of really good restuarants and interesting stores. Above this area, and climbing up 50 feet or so above sea level is the Teatro Solis, a nice old opera house. Continuing north, one encounters the Plaza Independencia, which celebrates Uruguay´s independence, and has a large statue of General Artigas (a hero) in the middle. On the north side of this plaza, one encounters a very strange building called the Palacio Salvo, which was, once upon a time, the tallest building in Latin America; the upper floor look like they are going to blast off for space at any moment. This building is on the corner of 18 de Julio, which then runs north for several miles through office buildings, hotels and shopping areas. The whole area bustles during the daytime, but tends to clear out at night. East of downtown is the Pocitos district, very high class, and in Pocitos one can find many, many interesting bars to visit. Pocitos is also where all the city´s beaches are, and they are absolutely packed these days. West of downtown, as I mentioned yesterday, turns gritty-industrial very fast, and the only reason to go there is if you are planning to ride your bike up Route 5 to Livramento, Brazil, or west on Route 1 to Colonia del Sacramento. The city of Montevideo has a population of 1.3 million, but the surrounding urban area (Canelones, Pando, etc) comes in at just below 2 million. Since the entire Republic of Uruguay only has a population of 3.4 million, Montevideo represents almost 60% of the country´s population. The second largest city, Salto, has less than 100,000 inhabitants, meaning Montevideo is about 20 times the size of the next biggest city. (The urban area of Rivera/Livramento is bigger than Salto, but two thirds of it is not actually in Uruguay, so this does not count.) This is the biggest discrepency of any country in the world. Montevideo is, in my opinion (jaundiced, having lived in Tijuana, Rio de Janeiro, and Washington, DC, all of which have been considered the murder capitals of their respective countries when I was living there...), a very safe city. There is no large, dispossessed underclass like you see in Rio, and the cops do not have eyeballs in the backs of their heads, afraid of being shot. While not as exciting as Buenos Aires (which is about 8 times as big), I like it. Greetings from Montevideo. Although I did not actually go anywhere today, it was an interesting, and very expensive, day. Yesterday night, coming off a long ride, I walked around a bit, and found a restuarant selling grilled meat (of course, this is Uruguay), but they also had some pastas, including lasagna. I ordered a sausage (Sausages here are very, very good.) and a lasagna. The sausage was very good, as anticipated, and the lasagna, which came next, was also very good, especially after I picked out the layer of ham that was inexplicably in the middle of it. If my Somali kids from Carver four years ago could have seen that, they would have thought I was getting ready to convert. Fat chance of that; I just do not like ham, especially in places where it has no business being, like lasagna. Ham removed, the lasagna was excellent, and when the bill came, it was in both Pesos and Dollars, with a slight benefit to paying in dollars, so I did. Uruguayan restuarants, and this happened again tonight, and has been happening since I entered the country, run a nice little scam where the food is reasonably priced, but they only sell little 9.5 oz bottles of Coke, and charge a fortune (three bucks a bottle last night) for them. I try to protect myself from this as much as possible by drinking a Coke before going to eat, and then asking for a cup full of ice to go with it; the ice melts and gives me more Coke. However, I drink a lot of fluid, and am usually good for at least two and maybe three Cokes at a meal, so I get it good from this little caper. It would be cheaper, by far, to just drink beer, but I do not like beer with meals. A friend of mine, yesterday, had provided me with the address of two bike stores, the Trek Store, and the Zenith Store. My plan was to wake up this morning early (meaning about 8), and ride over to Pocitos, about 6 miles away, and get it serviced. My day, as it turned out, started a lot earlier than 8. At about 4AM, I was awakened by a loud TV blaring in the room above mine. I put up with this for a few minutes, and then walked out to the reception area, and politely suggested that it would be a good idea to respectfully ask the gentleman or gentlemen in the above room if they would not mind turning the TV down just a teeny eeny bit. The night clerk responded with a blast about "these blankety-blank foreigners, who don´t sleep like civilized people. ", and then stomped off upstairs to give them the good news. It turns out the hotel has a contract with some freight shipping line, and hosts ship crews (All of whom are Philipine or Taiwan Chinese) when the ships are in port. I decided that I would not bother him with the fact that I was a foreigner too. Since I was awake anyway, I went outside, and, at 4:30 AM found a bar on the corner that was open and full of dubious looking characters, and induced them to sell me a bottle of Coke, which I took back to my now quiet room and read a book until about 6AM, when I finally went back to sleep. At 9:00, I woke back up, and grabbed the bike and a map, and set out for the Trek Store. Seven miles later, I got there, just as they were opening up. They told me they would be happy to service my bike, and it would be ready Friday of next week. I pointed out that Friday of next week, I will be 5,000 miles away from here. They said that was the earliest they could do. I then took the bike to the Zenith Store, and they were much less busy. For 810 Pesos (about $42 US), they cleaned the bike, checked everything out, and replaced the chain, which was loose. The only thing they could not do was replace my bald rear tire, because they did not have any such tires in my size. The tire is bald because of 1,233 miles of riding around with 45 pounds or so of stuff, plus my not insubstantial weight, hanging off the back axle. I will replace it once I get back to San Diego. There are two interesting things to note about my bicycle. First, I have not had a single flat tire this trip. In my saddlebags are the same dozen inner tubes I brought with me; I have not used a one of them. That is nearly miraculous. In 2007, I had to actually get a taxi the last ten miles or so into Montevideo because, unbeknownst to me, I had a microscopic piece of glass in my tire, and popped half a dozen tubes in the space of 20 miles. Now, nothing, in over 1,200 miles. Secondly, my bike, a new Trek 7500, has a front shock absorber, something I have never had on a bike before. I won´t say this has made the ride more comfortable, but it has certainly made it far less uncomfortable. On the subject of the bike, I have been in deep meditation, and have decided that, if given a choice between Uruguayan headwinds or Santa Catarina mountains, I would pick the mountains. When riding in the mountains, one knows that, more or less, for every monster uphill climb there will be a downhill glide. Rolling downhill allows me to stand up, take a load off my rear end, and coast for a while. This, in a sense, balances out the monster climbs. With these headwinds, on the other hand, it is just peddle, peddle, peddle, and peddle some more. If I stop peddling, the bicycle will stop in a matter of a few dozen feet. That means I am never out of the seat (Peddling standing up causes the bike to sway, which causes the saddlebags to rub against the rear tire. ), and never take the weight off my posterior. Since I had to leave the bike there, I was stuck with the dilemma of how to get back. As I had been riding down the Rambla towards Pocitos, I was struck by the number of girls out jogging, so I decided, quite coincidentally, that maybe now would be a good time for a long walk. I ended up walking the seven or so miles back in a couple of hours (I had nothing better to do anyway. ), and made it back to 18 de Julio a bit after noon. All that walking made me hungry, so I got a (very good) choripan and a Coke for 68 Pesos, and then set out looking for an ATM machine that did not have a long line of people waiting to get into it. I found one, eventually, and pulled out another 5,000 Pesos. From there, I wandered down to a car rental place, and reserved a car for this weekend. Business concluded, and with all those thousands of Pesos burning a hole in my pocket, I started looking in bookstores for the other volumes of the "Orientales" history of Uruguay series. To my delight, and to my wallet´s despair, I found them, plus other interesting books, and ended up dropping darn near a hundred bucks in the book store. These are not inconsiderable volumes, they run about 900 pages each, and I now have about 15 pounds of books; I am glad I did not buy all of them in Punta del Este. I then went and took a siesta (making up for my interrupted sleep early this morning), and about 7PM went out and caught a bus for Pocitos, where I picked up my bike. Since it does not even begin to get dark until about 9, I went for a ride down around the port area, and out west past the refinery and on to the cut off for Route 5. Montevideo, like Punta del Este, sticks out a bit from the land. At the very tip of the city is the port and container terminal. As you go east of this, the areas get nicer and nicer, until you are in Pocitos, which is an extremely upscale neighborhood. Going west, things deteriorate quickly; the refinery stinks (the government owns it, so what good would complaining be? ), and the surrounding neighborhoods, while not slums, are not exactly high class either. Coming back to my hotel, I dumped the bike, and went out and got a huge, juicy steak and another sausage. Uruguayan beef is probably the best in the world, and since I am here, I might as well partake as much as possible. I rode in today 64 miles from Piriapolis. Piriapolis is almost due east of Montevideo, so I was no longer riding south, but east, with, of course, variations along the way. Punta del Este is actually the absolutely southernmost point in Uruguay, and Montevideo is a few miles north of PDE. As has been occurring with dreadful regularity this week, the wind was not my friend today. Heading out from Piriapolis, I rode along the coast for about nine miles. First I went east, then I turned north to meet up with the main highway. Today´s wind was blowing strongly (surprise) out of the north north east. As soon as I turned north, I got it right in my face. I rode along a few more miles, and got on to Uruguay 99, which is the freeway (only it´s not free, you have to pay) to Punta del Este, turned east, rode a few miles, and got on to Uruguay 1, an excellent four lane freeway that runs to Montevideo. Since I was riding east north east, basically, I got the wind obliquely in the face for the next 40 miles. I moved along, averaging about 9 MPH, and stopped frequently for drinks; to my great happiness, Gatorade is now available almost everywhere (It was not three years ago.) and is the same price as in the US. I consumed mass quantities. It was very warm, and the sun was burning (It is less than a week from the southern hemisphere summer solstice) so I slathered this thermo-nuclear stick of sun block that I bought in La Paloma all over my face and right knee. It looked like I had leprosy, and the sun burned right through it anyway. The right side (north facing side) of my face is extremely burned right now. Had I NOT had this stuff on my face, I think I would dangerously burned right now. Getting it OFF my face was an operation which used up an entire bar of soap when I took a shower at my hotel this evening. As I rode along, I encountered numerous little beach towns, Atlantida and Parque del Plata being the biggest of them. 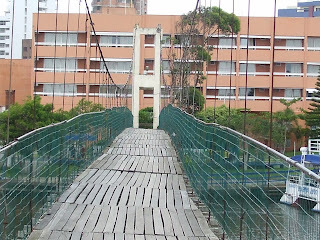 As soon as I got on Route 1, I rode through a toll plaza, then crossed a bridge over a river and exited the Departamento of Maldonado, entering the Departamento of Canalones. 40 miles later, I exited Canalones and entered the Departamento of Montevideo. Departamentos in Uruguay correspond, basically, to counties in the US or Municipios in Mexico. There are no States; there is a national government and 19 "intendencias", which are the departamental governments. Each Departamento has an elected "Intendente", who functions as a County Executive does in the States. I am proud to say that, over the years, I have been to ALL 19 Departamentos, and all of them by bicycle. I defy any of you to find another American (or Mexican, or anybody) who can say that. At about 50 miles into the ride, very hot, burned and tired, I rode past the sign that said "Bienvenido Montevideo", and found myself on the Rambla Republica de Mexico. Montevideo is surrounded by Ramblas, which are pretty boulevards that parallel the beach on both sides of the city. At this point, I was really tired. I rode past the Uruguayan Naval Academy, and the old Carrasco Casino, which appears to be being rebuilt from the inside out. After a bit, I stopped to call a friend who lives in Montevideo, to inform him that I had arrived, talked to him for a bit, hung up, and nearly passed out. Everything started to go a bit black, so I sat down abrubtly on a wall next to the phone booth, and just stayed there, in the shade, for about 15 minutes until I felt better. I moved on down the Rambla another four or five miles, saw an ANCAP station (more on ANCAP in a moment), and decided now would be a good time for more Gatorade. Darned if I did not almost pass out again, while in line to pay for it. I got out of the store in a hurry, and went straight to a table outside and collapsed into the seat. To put it mildly, the distance I rode today, combined with the wind, sun, and high temperature, does not seem to have been a recipe for good health. Feeling better, I rode on, passed the fortress-like US Embassy, stopped at an ESSO station for yet more Gatorade (sans any further drama), and then turned right, rode up a hill, and found myself on Avenida 18 de Julio, Montevideo´s main street. 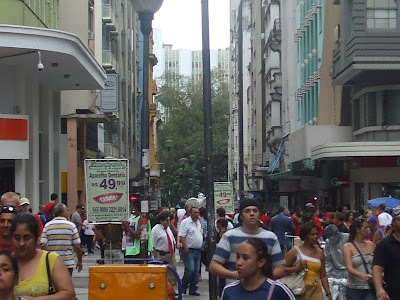 From 18 de Julio, I moved a block to my right, rode along, and encountered the Hotel Richmond. Staying at the Hotel Richmond, in a sense, closes a circle. On my very first long bike ride, in November of 2004, I stayed at this hotel on my first night in Montevideo, before starting out on the first day`s ride of my first bike trip. Now, after the last day`s ride, on what has to be my last bike trip in Uruguay (There are literally no more places for me to go; no more roads to ride on.) I return. To my surprise, they remembered me. (I did not stay here in 2005 or 2007.) To my disgust, the room that cost me $12 US in 2004 now costs $40, and yes the prices are quoted in Dollars. I forked over $120 for three nights, and went in and collapsed for a while on the bed, followed by a long shower while I tried to get all the sun block off. I eventually emerged, tried to use the hotel computer, which looks like it might be ten years old, and acts the same, and then hit the street. I found a restaurant that claims to sell lasagna, so I may return there later for dinner. I mentioned ANCAP above. Like Mexico, like Brazil, Uruguay has a national petroleum company. Unfortunately, Uruguay does not actually HAVE any petroleum, but, hey, why let minor details like that prevent you from having a nationalized oil company. ANCAP imports crude oil, refines it, into many products (the second "A" in ANCAP stands for Asfalto. ), and then sells it, both through its own service stations, and through distributors, which include ESSO (known to us as EXXON), and Petrobras. ANCAP also sets a national price, so the price of gasoline is the same everywhere...about six bucks a gallon. Petrobras does the same thing in Brazil, except Brazil does indeed have oil, and in boatloads, but Petrobras does not set a price, so pump prices vary, drastically. I had not seen Petrobras stations in Uruguay before; they must be expanding. If Brazil has half as much oil as they think they do, we will probably see Petrobras stations in the US someday. Montevideo is a city of about 1.5 million people. It is the capital of Uruguay, and is also the "capital" of MERCOSUR, so when there is a MERCOSUR meeting, the presidents of Brazil, Argentina and Paraguay come here. Montevideo did not get to be capital because of its innate greatness; it is capital because Brazil and Argentina cannot stomach the thought of the capital being in the other country. The city is prosperous, and, generally, clean. Lately the garbage collectors have been on strike, and the President had to order the Army into the streets to pick up trash. Tomorrow, I am going to take my bike to the Trek Store for a cleaning and tune up. Other than that, I have no plans, just take it easy for a couple days. I will right more, in a day or three. Greetings from the small beach town of Pirapolis, 45 miles or so east of Montevideo. Once again today, the wind was not my friend. 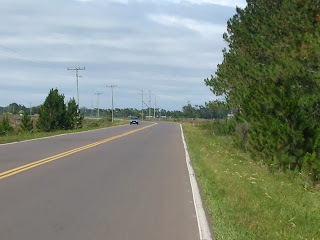 As soon as I got out of Punta del Este this morning, and got on the main road east out of town, I ran into the same headwind that has been bedeviling me. When one is on flat ground, doing 7MPH in 2nd gear on an 18 speed bike, (not counting the hill climbing gear set) something is very wrong. I crawled along, and about eight miles out of town, climbed a rather large hill, and, coming down the other side, found myself on Route 10 again, only now it is a freeway. A few miles further along, I passed the Punta del Este international airport, and slowly continued into the wind. About 20 miles into the ride, I came to a paved shortcut into Piriapolis, and took it. This brought me back to the beach, from where I could see the towers of PDE, 20 miles to the east of me. I had left my hotel at 9:30 this morning; at 12:30, three hours later, I had ridden less than 24 miles. At this point, I figured that I would not get into Montevideo until after dark, so I decided to stop in Piriapolis. I rode the few more miles into town, slowly, and found myself a decent hotel at about 1:30 this afternoon. Since the sun was shining and it was warm, I got my bathing suit out of the pack, took a book and some money, and went to the beach, which is now on the River Plate, not the ocean, and rented a chair and an umbrella, where I stayed, alternately reading and going in the water, until 6:30 or so. The bike ride itself was uneventful, if slow. One happy discovery was I found a place selling Gatorade. Piriapolis is a town with an interesting history. It did not exist until 1930, when an Argentine named Piria arrived, constructed a huge hotel, and set up a ferry service to bring tourists in directly from Buenos Aires. Piria is long dead, but his hotel, called the Argentino Hotel, still exists, and now houses expensive rooms and a large casino. The rest of the town has built up around the hotel, and the place still attracts lots of Argentine tourists, although there is no more ferry service. Supposedly, Piria also wanted to set up a Dirgible service from BA, which would sure have been a fun ride. I am now 50 miles or so out of Montevideo, so, one way or another, tomorrow I will ride on in. I am hoping to take my bike to the Trek Store there for an overhaul, which, it occurs to me, would probably be a LOT cheaper than getting it done in San Diego in January. Tonight I am in Punta del Este, which is probably the premier beach resort in all of South America. I was awakened this morning by the sound of my room in La Paloma´s fan shutting off. The UTE (Uruguayan government electricity company) was doing something to the transformer on the pole outside my window. I got up, got dressed, retrieved the clothes I had had washed, packed up my bike and paid off the owner (Who, incidentally, refused to charge me for washing the clothes), and headed out. Today had absolutely the strongest winds I have yet encountered on this trip. They were not in my favor. 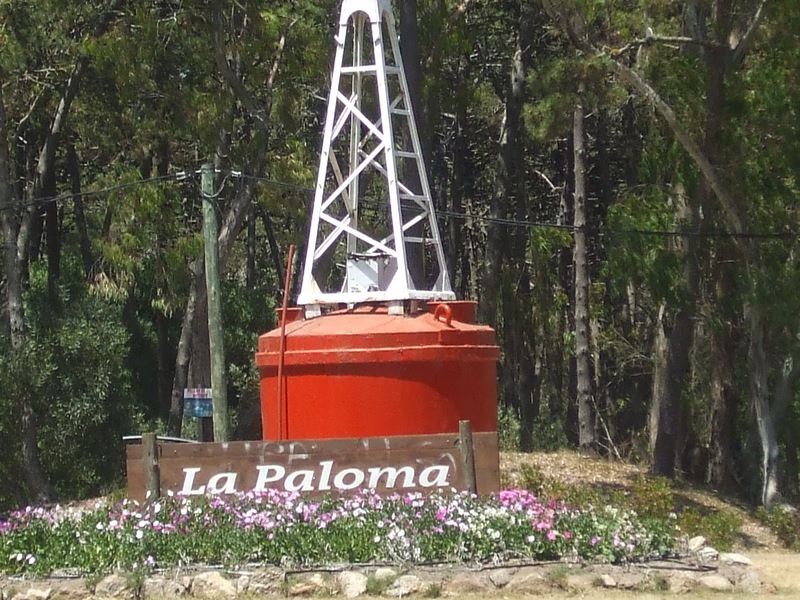 From La Paloma, I had to ride about 18 miles up Route 15 to the intersection with Route 9. Unfortunately, Route 10 stops in La Paloma (Due to a huge lake in its path) and does not pick up until some miles west. I had to ride north and a little west up to Route 9. The wind was blasting straight out of the west, so strongly that several times it literally moved me off the pavement and onto the shoulder. Even though the wind was not in my face, it took me over two hours to get to Route 9. The scenery along Route 15 was pastoral, lots of cows to keep me company. Arriving at Route 9, I turned left and got the wind full in the face. I tried this for half a mile, got nowhere, and decided that this was not going to work. So, I headed back, and rode a mile north of the highway into the town of Rocha. I made it downtown at about a quarter to twelve, found the bus terminal, and spent 72 Pesos for a ticket on the 1 20 PM bus east to San Carlos. Rocha has a pretty tree lined plaza in the center of town, I walked the bicycle around this plaza and found a newspaper vendor from whom I bought the paper, and went and sat in the plaza reading it until the bus came. The wind whistling threw the park was impressive. 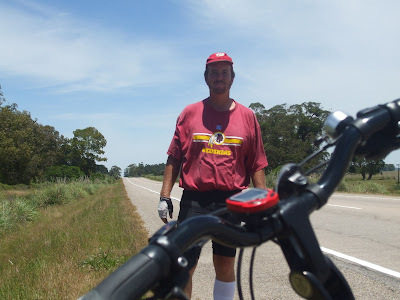 I threw my bike in the baggage compartment of the bus, climbed on, and in an hour was in the very small town of San Carlos, which is about12 miles due north of Punta del Este. In San Carlos, I retrieved the bike, and headed south on Rt. 35. To my great joy, the wind now shifted and was roaring out of the south. I eventually made it through the town of Maldonado, which is where everyone who works in PDE lives, and then on a few more miles into Punta itself. Punta del Este is an extremely upscale resort, with prices to match. To save myself from this, I found the bus station, and then checked into one of the hotels near it, which are always cheaper. "Cheaper" is relative, my room cost $40 US, but it has AC and is clean, so I can live with that. Unlike the rest of Uruguay, most prices in Punta del Este are quoted in Dollars, not Pesos, because there are so many people from so many countries visiting here. This is the third time in four bike trips here that I have been through PDE, and I like it, for a day or two. This would not be my choice to spend a two or three week vacation because the idea of hanging out with the Beautiful People does nothing at all for me. Punta del Este itself is like a thumb sticking about a mile south out of the mainland. The north half of this thumb is full of upscale hotels, casinos, restuarants, VERY expensive stores, and discos. The south half is full of houses, but nobody lives in them. They are for rental, at astronomical prices. The left (east) facing beaches front on the Atlantic Ocean, and the right (west) facing ones on the Rio de la Plata (River Plate). At the very bottom of the peninsula, where ocean and river meet, is a little monument to the "Commonwealth of British Nations" in honor of the events that occurred in full sight and hearing of Punta del Este, curiously, exactly 71 years ago, on December 13, 1939. I will not repeat what I wrote three years ago about this, but, in a nutshell, this is when the Royal Navy caught up to the Graf Spee, damaged it and forced it to put into Montevideo the next day. 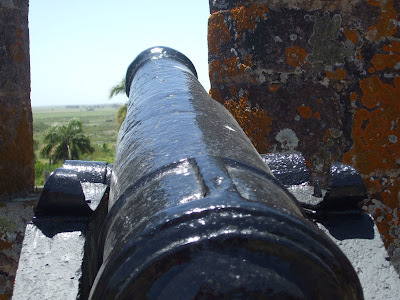 The Uruguayans, exercising international law as a neutral, gave it 24 hours to get out (The government was terrified that the British would come right into the harbor after it. ), but get out it did, and it was scuttled somewhere off Montevideo. On the west side of PDE is a marina full of some very expensive boats. The streets are full of cars with Argentine plates, and all the newstands sell Buenos Aires papers as well as Uruguayan ones. After getting my hotel, I rode my bike around the peninsula, for the fun of it, and then walked same. I also walked through the hotel district, and found a TRUE sign of civilization. On one corner there is a McDonalds on one side of the street and a Burger King on the other side. One of the things I like about this place is that there are several very good bookstores. In 2007, I bought the first two books of what I thought would be a three volume political history of Uruguay called "Orientales", and I went in to a bookstore to see if I could find volume 3. I found volume 4. The cost was enough to make me give live birth. I figured that when I get to Montevideo I could look for volume 3, but, when I looked carefully at the book, it mentions a volume 5 as well. The three of them, if I find them all, will set me back over a hundred bucks. Oh well, it is only money. It is now 8 35 PM, is still broad daylight, and most restuarants are just now starting to open. So, I will now go and try to find some food. Tomorrow I may move on to Montevideo, or may just go to Piriapolis, depending on the vagaries of the wind. Here I sit, stuck in La Paloma. Yesterday was a beautiful, hot, sunny day. Today it looked like winter. From midnight until about 3PM, it absolutely poured down rain, and a strong wind out of the south brought temperatures that never climbed above 60 degrees. What a miserable day. So, one more day at the beach for me, although I won´t be going near the beach in this weather. During a lull in the rain this morning, I went out and bought the newspaper, and, the choripan carrito being closed, stopped by a similar carrito selling hamburguers. Uruguayan hamburguers are interesting, to say the least. An extremely wide, extremely flat piece of meat is served on a "bun" that looks more like a piece of pita bread. They are edible, but are very strange looking. Returning, I talked a while with the hotel owner, who leads a rather fun life. He runs the hotel from November until Easter, then leaves it in the charge of one of his sons for the rest of the year. Parked out front is an ancient school bus that he owns, which has been converted into a kind of mobile home, and has cooking facilities, a bed room, and what amounts to a full bar set up inside. The owner finds a temporary girlfriend, sometimes the same as last year, sometimes not, loads up the bus, and heads to Brazil for three months, with no particular set destination. When the money runs out, he comes back home. He has gotten as far north as Belem, Para, which is probably 3,000 miles away from here. All in all, it is an interesting way to live, and one of which I fully approve. I suggested he knock off the trips for a few years, save his money, and try to drive the bus all the way to the United States. The hotel´s animals also travel in the bus, which must be fun. One enormous dog lives with a much smaller dog that looks like a dust mop, and they both coexist with a cat. In the vacant lot owned by the hotel next door is a pond which is full of some of the loudest frogs I have ever heard. All in all, I could be stuck in worse places. Greetings from La Paloma, again. It turned out to be a nice day to do nothing, so I decided to stay here, which gives me the added benefit of arriving in Punta del Este tomorrow, not today, and hopefully paying mid-week prices for a room there. This morning, I rode around and out of town for a while, and came back ready for a shower...to discover, again, no water pressure. This gets old. I went down and made some noises about moving to another hotel with water, and they went and did something, I know not what, and, presto, I had water. I then went and got more choripanes, and did not get sick, yet. I spent most of the afternoon at the beach, after absolutely covering myself with sunblock. The water is freezing, imagine San Diego`s beaches in June. I went in, but did not stay in for long. The beach itself is nice, and there is enough of a breeze to drive away the mosquitos. Tomorrow, I should move on to Punta del Este, 80 miles or so down the road. Greetings from the beach town of La Paloma, which is located a bit more than 90 miles south and east of Chuy. I rode here over two days. Yesterday morning, I re-installed the saddle bags on my bike (a laborious task), and retrieved my two frozen bottles of water from the hotel´s freezer. It must have been some freezer, because they never did completely thaw out. 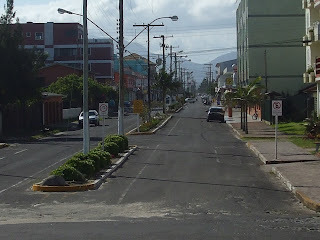 I then rode up one last time into Brazil (In other words, I crossed the street. ), and purchased three mini-Cokes, paying with Uruguayan Pesos. 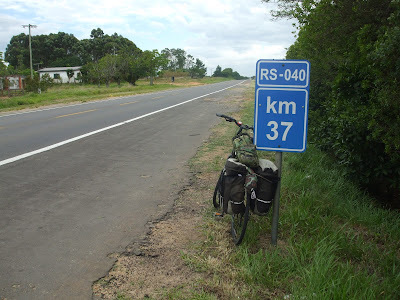 From there, I rode down Avenida Uruguai, made a right turn, and found myself on Uruguay Ruta Nacional 9, headed south and east, 338 kilometers from Montevideo. For what it is worth, I am no longer so much heading "south" as I am heading "west": the geography has caused the coast line of Uruguay to run almost directly east to west. The insane wind out of the west having died down, I headed down the road, rode past the Uruguayan immigration station that I had visited the day before, and made pretty good time. The entire country of Uruguay is basically part of the Pampas, so there are no vast changes in elevation, and, along the coast, the highways are essentially flat. If you have a tailwind, it is paradise, if a head wind is present, look out. The countryside on both sides was green pasture, punctuated by occasional ranch houses, and populated by many cows. Over the next hour and a half, I drank all my Cokes, and was somewhat consternated to discover that my water bottles would not thaw out. They must have been kept in absolute sub-zero temperatures. About 20 miles down the road, I came upon something interesting, the highway, which had been one lane in each direction, had about 75 feet of extra concrete added to it, and became an 8,000 foot long emergency landing strip for, I assume, planes out of Carrasco in Montevideo that get in trouble. There was a huge sign saying NO PARKING on the side of the road leading up to this. Being out of Coke, and unable to access my water, I started getting thirsty. After about 43 miles, I came to the little town of Castillos, which is well and truly an armpit. I rode in at about 2PM, and could not find an open store; it was siesta time. I finally found a little store, and was told that they were out of Coke, water, and any other non alcoholic drinks. Luckily, I found a little bar, which was basically a shack with a pool table in it, and was able to buy two little 8 oz bottles of Coke. They made me feel a lot better. For whatever reason, I was low on motivation yesterday, and did not feel like peddling any more, so I got off of Rt 9, and turned left (south, west) onto Rt. 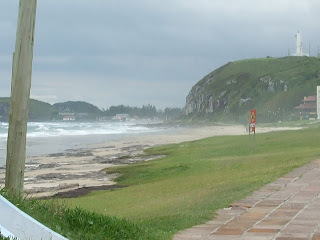 16, which took me into the little beach town of Aguas Dulces. I could have gone on to La Paloma, where I am now, but just did not feel like it. I had been warned that Aguas Dulces was dead, and it sure was. I found one open hotel, one open restuarant, and no internet places. I overpaid for the hotel, went and sat on the beach for a couple of hours reading a book, and went for a walk through town. Then I ate dinner and went to sleep. How exciting. Since I am now moving almost directly west, by the way, it is getting dark about ten minutes later every day. Last night, it was still quite clear out at 9PM. I rode a total of 53 miles yesterday. Today I woke up and exited (happily) out of Aguas Dulces as fast as I could. I rode a mile out of town, and then turned west on Rt. 10, which is a secondary highway that runs parallel to Rt. 9, with about ten miles seperating the two. The wind was my friend today, and I rode the 40 miles into La Paloma in less than three hours. The scenery was the same as yesterday, and off to the north, in the distance, at one point I saw what must have been dozens of windmills generating electricity. Frankly, considering Uruguay`s terrain and the wind situation, there is no reason that they could not generate 100% of their electricity needs via wind power. Hopefully more windmills are in the works. After I had ridden about 30 miles, I came to the cut off for a little town called La Pedrera, and then, a few miles further along, came to the main road that links Rt. 9 and the city of Rocha with La Paloma. I rode another few miles towards the coast, and found myself in town. This is the third time I have been to La Paloma, having been here during my 2004 and 2007 bike trips. I went and found the same hotel run by an old hippy-type and his family that I had stayed at previously, re-introduced myself, and got a room. Here it got fun. Outside, was a truck from the water agency, with a few guys digging a hole in the road. I thought nothing of it, went to my room, stripped out of my sweaty clothes, and happily stepped into the shower and turned the knob. Nothing came out. In disgust, I threw on shorts and a shirt, and went downstairs, to find the irritated owner apologizing for having no water pressure. Not his fault, so I was not upset. I went back upstairs, decided I would just go without a bath for a few hours, and put on my shoes and socks. On my way out the door, for the heck of it, I tried the knob again. I got a full blast of water. Happy, I took all my clothes off again, jumped in the shower, shampooed up,,...and the water turned off. My hair was covered with shampoo, and I was getting a little dribble of drops out of the faucet. It took me a good ten minutes to get that shampoo out of my hair. Eventually, I got dry, and headed out into Uruguay. I know I am now in Uruguay for a number of reasons, apart from the language people are speaking. One is that none of the motorcycle/motorbike riders I encounter is wearing a helmet. Another is that there are "carritos" (roach coach like food trucks) selling Choripanes on many corners. A Choripan is a sausage (chorizo) on a piece of bread (pan). I got a couple of choripanes, fries and a Pepsi for not much money at all. Sometimes, Choripanes come with an additional ingredient of E-Coli, absolutely free. (I got violently ill in 2007, in Trinidad, from one...) Hopefully today´s did not. Full, I went and bought two newspapers, El Pais (conservative) and La Republica ("progressive"), and went to the beach to read them. The (very "progressive") union representing garbage truck drivers in Montevideo is currently on strike against the (very "progressive") municipal government, and mountains of trash are accumulating. It was hilarious reading La Republica and seeing them twist themselves into an ideological pretzal as they attacked the union for having the temerity to strike against a "populist government". The wind started to blow up, clouds covered the sun, and it started to get chilly, so I retreated to the hotel, put on long pants, and came to this internet place to check the weather. It might, or maybe won`t, rain tomorrow, so I may or may not stay here an extra day. If I do not stay, I will try to move on to Punta del Este. Today`s total ride was a wimpy 40 miles. Greetings from Chuy, still. The wind arrived from the southwest as promised, and it was howling. Since I needed to wash clothes anyway, this seemed a good excuse to stay in Chuy for a day. I wandered out into the street this morning, and headed to the tourist office, where I got a couple of very useful maps, for free. From there, I headed up to the exchange house, and discovered that the Dollar had moved 10 Centesimos in my favor overnight, to U$19.60. I took five $100 bills from my belt, and turned them into U$9,800 Pesos, and then turned R$40 that I still had into an additional U$440. I then wandered across the street into Brazil and bought another mini-Coke using Real coins that were burning a hole in my pocket. Returning to my hotel, I commenced whining to the owner about how the weak dollar was burning through my money, and could she please help out a poor tourist with a break on the price of a second night? To my surprise, she did, knocking 200 Pesos off the price. I then went up to my room, and laboriously folded five 1,000 Peso bills (Uruguayan currency is MUCH bigger than American currency; the things all stick half an inch above the top of my wallet.) and put them back into my belt. I am carrying, literally, a couple months salary at the minimum wage, and it would not do to keep it all in one place. I then handed over my dirty clothes, removed the saddlebags from my bike, and went out to take a ride. Since the wind was blasting from SW to NE, I decided to go perpindicular to it. First I rode back into Rio Grande do Sul, and then headed southeast on RS 669 five miles to Barra do Chui, which is a little beach resort and is the absolutely southernmost spot in all of Brazil. On the way, I used the last of my Real coins for another Coke and a bottle of water. Arriving at the water, I took a few pictures, looked around at all the closed businesses (Nothing will open until Christmas. ), and then rode south towards the "International Bridge", which sounds impressive, but is really a decrepit piece of concrete over a ditch full of trash. I rode past a very boring looking Uruguayan Navy base, and then got on a nameless Uruguayan road and rode the five miles or so back to Uruguay Route 9, where I turned right and got the full force of the wind in my back. 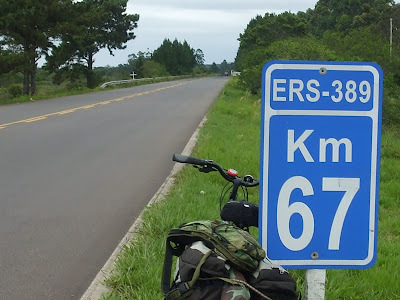 With no saddlebags, I did 25 MPH for about three miles until I hit the immigration station, where I stopped and had them stamp my passport; I has spent the previous night as, officially, an unperson, since I was no longer legally in Brazil, but had not legally entered Uruguay either. As I was riding up Rt. 9, I was glad I was not heading in the other direction, that wind was impressive. Having my passport stamped, I headed back into town, and decided to ride to the Fuerte San Miguel, which is an 18th century fortress standing to the west of town. I rode west through town on Ave Brasil, until it ended and became Uruguay 19, which headed straight west about ten feet south of the border. 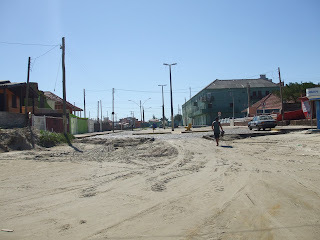 Something very curious that I noted is that, on the Brazilian side, were, from time to time, houses who`s driveways fronted onto Rt 19; they HAVE to go through Uruguay to get home. I wonder what they do if someone is breaking in and they call the Brigada Militar; can the BM people drive through Uruguay, armed, to get there? Would the Uruguayan police respond if they saw something bad going down? Who knows. After about five miles, I came to the entrance to the fort, paid 15 Pesos to the very bored looking soldier at the entrance, and got him to promise to watch my bike, and went in. It is a generic 200 year old fort, and looks very much like Fort Washington on the Potomic below DC. Inside were interesting exhibits, but, once you have seen one of these forts, you have seen them all. I looked around for 15 minutes or so, and, since I was getting very thirsty (The water bottle was long gone, and nothing was for sale there. ), headed back to Chuy. Getting into Chuy, I stopped into a gas station on the Brazilian side for a Coke, which I paid for with Pesos. Boy did it taste good. I then went back to the hotel, took a nap and a shower, waking up just before 5PM in time to go running to the ANTEL (Uruguayan government owned-and-misrun phone company) store for a phone card. I was tempted to visit the slot machines in the Uruguayan casino in town, but decided I would be better off just flushing my money down the toilet. Tomorrow, the wind is supposed to shift a bit in my favor, and I will move on, further into Uruguay. In those 24 days, I managed to spend R$2,833, which is an average of R$118 a day, or just about US $69 a day. Factor out unexpected (and unwanted) bike maintence expenses, and I am under R$110 a day, which is not too far off my goal of 100 Reais a day. I have set a goal in Uruguay of a thousand Pesos a day, about 51 Dollars. Greetings from Chuy, Uruguay, which is across the street (literally) from Chui, Rio Grande do Sul. I rode a total of 53 miles today, and how I ended up HERE is interesting. I woke up this morning in Pelotas about 9AM, having slept ten and a half hours; I was absolutely exhausted last night. After eating a slice of bread and some orange juice, and stealing a couple of apples for later, I went to the hotel`s garage to retrieve my bike. Being the non-trusting type that I am, I had chained the bike to an electrical cable the night before, figuring that anyone who tried to steal it would probably electrocute themselves. The chain I used I bought three years ago, and set the combination myself, using my birthday, so I would not forget it. I tried again. No luck. I mixed up the numbers, and then tried again. Nada. Figuring that maybe I was seeing it wrong, I went and turned on all the lights, and tried again. Zilch. I started to get uptight, because it was getting on towards 10AM, and I was going nowhere fast. My plan was to ride to Rio Branco, Uruguay, which was 90 miles. I went and informed management of my little problem, and one of their minions spent half an hour or so looking for a pair of bolt cutters. When he finally found them, they would not cut. My bike chain was specially made of thin wires rolled into thicker cables, rolled into one very thick cable, especially to defeat bolt cutters. It functioned as promised; everytime I would squeeze on the bolt cutters, the wires would all flatten out, but they would not cut. So, the minion went off and found a hacksaw blade, and spent a quarter hour cutting through the lock. I was VERY happy to have that problem solved, and gave him 20 Reais for his troubles. It was now past 11AM in the morning, and at this point I faced the very real threat of getting caught out on the highway after dark if I headed for Rio Branco. However, waiting a day was not an option, because the winds for tomorrow are supposed to turn around and blow out of the South South West (Exactly the direction I would have headed) at 20 MPH. I am not doing that for 90 miles. So, I changed plans. Instead of heading southwest to Rio Branco, I headed east on BR 392 towards the town of Rio Grande, 35 miles away. Rio Grande is home of something called the Super Porto, a huge port and rail complex. I spent three and a half hours battling a head wind, and arrived dead tired at about 2:45. On a whim, I rode to the Rodoviaria (Bus Station). From Rio Grande, it would be a 130 mile ride to Santa Victoria do Palmar, with NOTHING in between. Obviously, at 2:45, I was not going to ride that distance. Equally obviously, if the wind performs as promised tomorrow, it wasn`t going to happen then either. So, to my pleasant surprise, I found a bus ticket to Santa Victoria leaving at 3:30. I bought it, and had no arguments from the bus driver about loading my bike into the baggage section below the bus. Santa Victoria is about 15 miles north of the border at Chuy. I arrived at about 7PM, and, since it does not get dark in these parts until almost 9PM, grabbed the bike and headed south, on BR 471. I had the wind to my rear, and flew along, arriving 45 minutes later at the Brazilian immigration station a couple of miles north of town, where I stopped, turned in my I-94 equivalent, and had them stamp my passport. I then rode into Chui, Rio Grande do Sul. 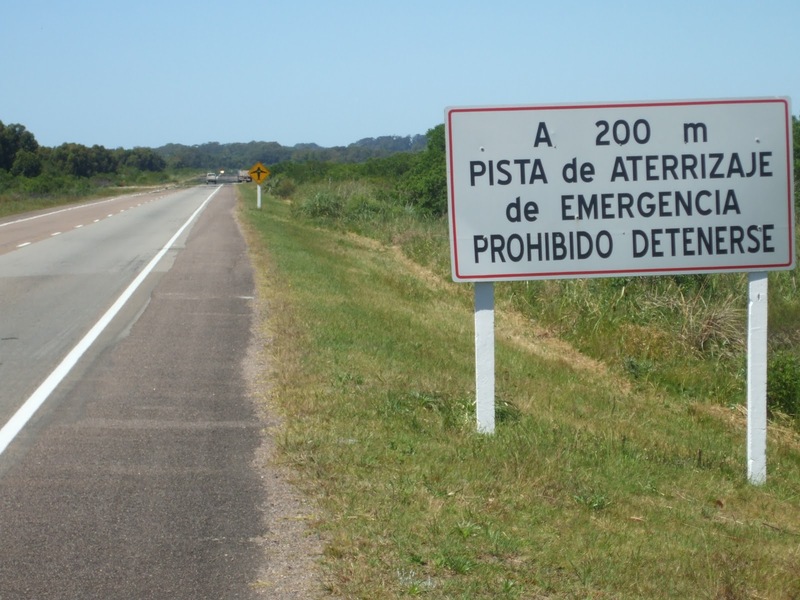 The Brazilian/Uruguayan border is unlike anything you will ever see in the United States. It is completely open, with no impediments to crossing anywhere. This creates what amount to international cities, the biggest one being the conglamoration of Rivera Uruguay and Santana do Livramento, RS, about 200 miles west of here, which has a population of over 100,000. The two Chuys don`t come anywhere close to those numbers; there might be 5,000 people living here, but they are basically ONE city, albeit with two mayors, two police forces, and two different national phone services. The south side of the main street here is called "Avenida Brasil", and it is in Uruguay. If you get to the middle of the street, its name changes to "Avenida Uruguai", and it is in Brazil. All the good restuarants are on Ave. Brasil, because some years ago fundamentalist got elected Prefeito of Chui, RS, and made it very dificult to sell alcohol on that side of town. 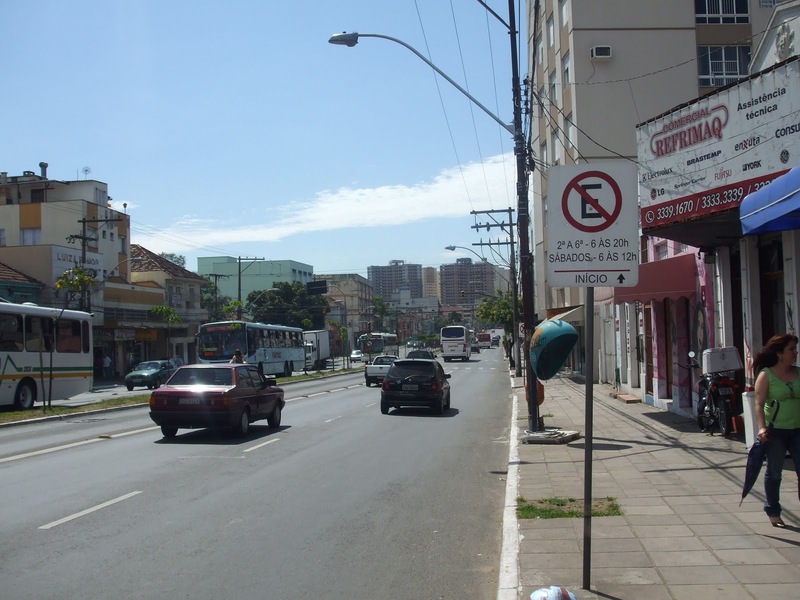 Ave Uruguai is populated with pharmacies and stores selling auto parts. As I was eating, on the outside terrace of a steak place on Ave. Brasil, I watched people parking RS plated vehicles in Uruguay, and then walk back into Chui. These are people who have "issues" with their registration, and do not want a Brazilian tow truck hauling their car off to the Brazilian impound lot while they sleep. I rode into town, hunted up an Uruguayan ATM machine (The last thing I wanted was to accidentally get more Brazilian currency), and rode past a closed, since it was late, exchange house. I almost had a heart attack. The dollar is at U$19.50. Once upon a time, it was over U$30. Prices are still cheaper, although not much, than in Brazil, but this devaluation of the Dollar is killing me. Getting into my hotel, I took a much needed shower, and headed out. First stop was the pharmacies on the Brazilian side, to stand on the scales. I did my usual three scales (in case one is wrong), and found that I weigh 192.25 pounds, fully clothed. I am now off over 15 pounds, plus the weight of my clothes, from when I started. This weight loss manifested itself in a funny weigh in the bus station in Rio Grande; having bought my ticket wearing bike shorts, I went out to the bike and grabbed my normal shorts, and put them on over my bike shorts, then retrieved my belt from my long pants, and walked into the men`s room to put it on. My pants fell down on the way in, like I was one of those thug-life gangsters you see in North East. My hotel is on the main Plaza of Chuy, and I discovered a (closed) tourist office, where I am going to try to get a free map of Uruguay tomorrow. (My excellent map of Uruguay is sitting at home, taped to my wall. That is a really useful place for it...) Depending on what the wind does, I may stay here a day, or I may move on. 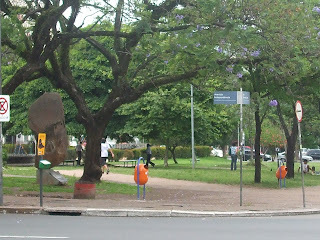 Greetings from Brazil´s southernmost large city, Pelotas. After riding 162 miles over two days, I am almost out of the country. On Sunday morning, I woke up in Porto Alegre and it was raining. So, I wandered up to the top floor of the hotel, looked at the internet for half an hour, ate something, and it stopped. 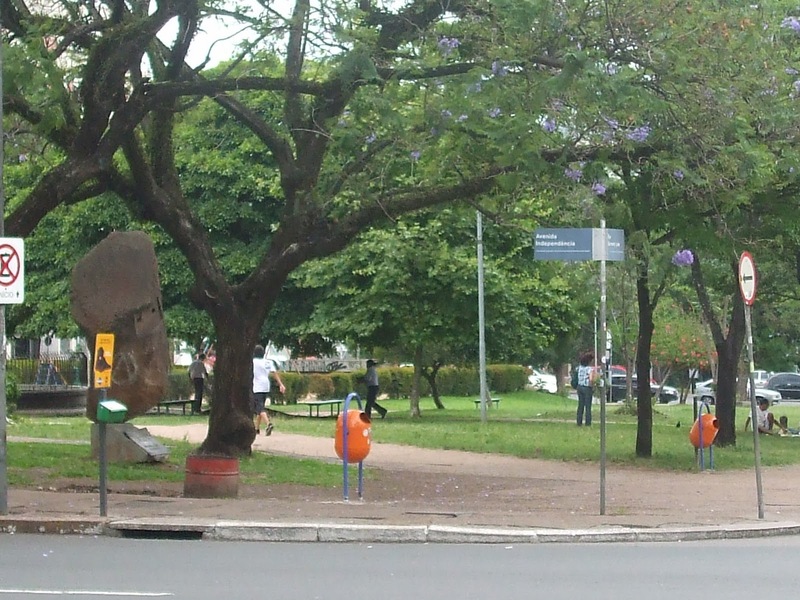 At about 9:30, I headed out into a deserted downtown Porto Alegre. As I mentioned, Brazil shuts up tight on Sunday, which is the reason I wrote no report yesterday. I had to get across a rather large river, and to do that, I rode a mile or so north through downtown, and then got on an almost deserted freeway and rode several miles further north. This, eventually, brought me to the BR-290, heading west, and I rode around the interchange, past a ¨no bikes¨ sign, and immediately ran into a traffic jam. The drawbridge was up. I wormed my way half a mile to the front of the traffic, and waited. The bridge is a London Bridge type of draw bridge, where one span is lifted about 50 feet straight up into the air.After about 15 minutes, it finally came down, and I set off across the first of what would be about a half dozen bridges over an eight mile stretch, interspersed with little islands. 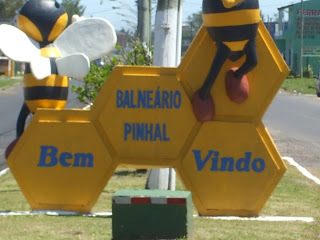 When I finally got done with the bridges, I was in the charming metropolis of El Dorado do Sul. I proceeded west another few miles, and came to the cut off for my old friend from Santa Catarina, BR-116, heading south to Uruguay. I headed, now, into an indirect headwind. No fun. It was not as bad as what I hit coming out of Torres last week, but it was no fun. 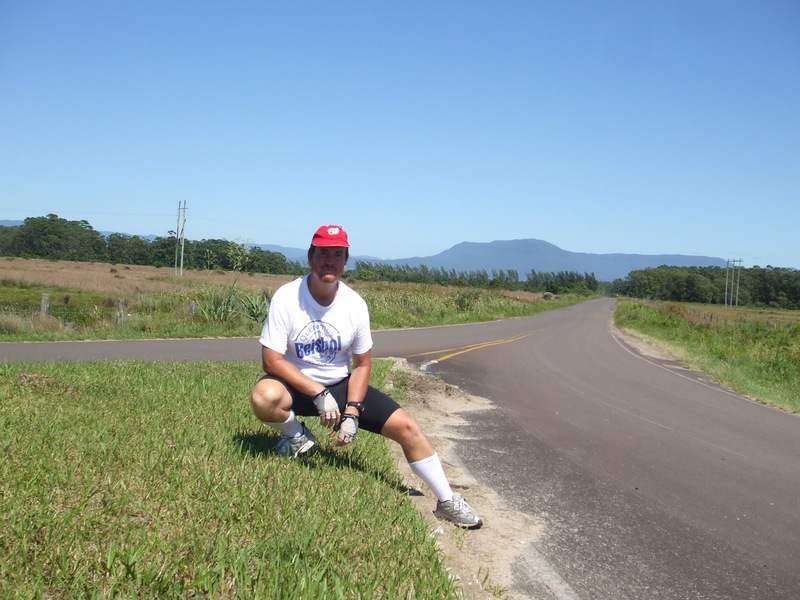 I pounded along at about 10 MPH, and, after a few miles, and about 13 miles into my ride, I came abreast of downtown Porto Alegre, maybe two miles away. What an utter waste of time all that was, but, the bike does not swim, so what can you do. I could tell this was going to be a long day, and was very glad for the three frozen bottles of water I had with me. Cold water is a gift from the gods on a hot day on the bike. A few miles further along, I got a good idea that I was getting closer to Uruguay; the toll plaza had a sign, in Spanish, saying ¨No foreign currency accepted.¨ I rode through it, continued, and passed little towns like Mariana Pimental, Guaiba, Sertao Santana, and, 50 miles into the ride, Sentinela do Sul. I had thought about stopping in Sentinela, but I felt good, and it looked like an armpit. I decided to continue on another 25 miles to Camaqua, which is midpoint between Porto Alegre and Pelotas. Past Sentinela, the wind shifted a bit in my favor, and things were looking up. I eventually came to the turn off for Camaqua, and got the pure joy of having to ride three miles into town over cobblestones. In the 21st century, I do not know what idiocy inspired them to pave streets with cobblestones, but there you are. Cobblestones are very bad, because the vibrations they cause can cause spokes to break, to say nothing of what they do to my posterior that has been in a bike seat for the previous 75 miles. I got into town about 7PM, rode around a bit, and got a decent hotel, paying extra for a room with air conditioning. I had ridden 81 miles. It was not really warm enough to warrant AC, but the concept of ¨screens¨ seems lost on Brazil, and AC is a way to keep the flying creatures out. This town was absolutely jumping on a Sunday night, with the 15 to 25 set hanging out in front of the park drinking and playing their car stereos as loud as they could. I found a good Italian joint, got a lasagna for two people, ate all of it, and went straight to bed. I had been riding for over nine hours and was dead tired. Total mileage for the trip at the end of yesterday was 798 miles. This morning, I got up, rode over more cobblestones back out the southern entrance to the town, and stopped at a little bar and had a Pepsi and bought two bottles of water. Then I headed out, entering the BR-116 at KM 400. Today, the wind was my friend; it was either at my back or blowing at right angles to me. Two hours and 25 miles out of town, I passed the little town of Cristal, and a sign that said 86 Kilometers to Pelotas. In an unremarkable ride, I rode past Sao Laurenço do Sul and Turuçu, and, boogied along. Towards the end of the ride, I noticed my left rear saddlebag was starting to swing in and rub against the rear tire. At the 500 KM post, I stopped to check it out, and discovered that I had lost a screw on my luggage rack, and it was no longer attached on that side. Luckily, I have a couple of extra screws built into the bike frame, so I took the saddle bags, tent, and everything else that was attached to the rack off, used my Allan Key to get a screw, and re-installed the rack. Problem solved. Riding on, I came to the turn off into Pelotas. 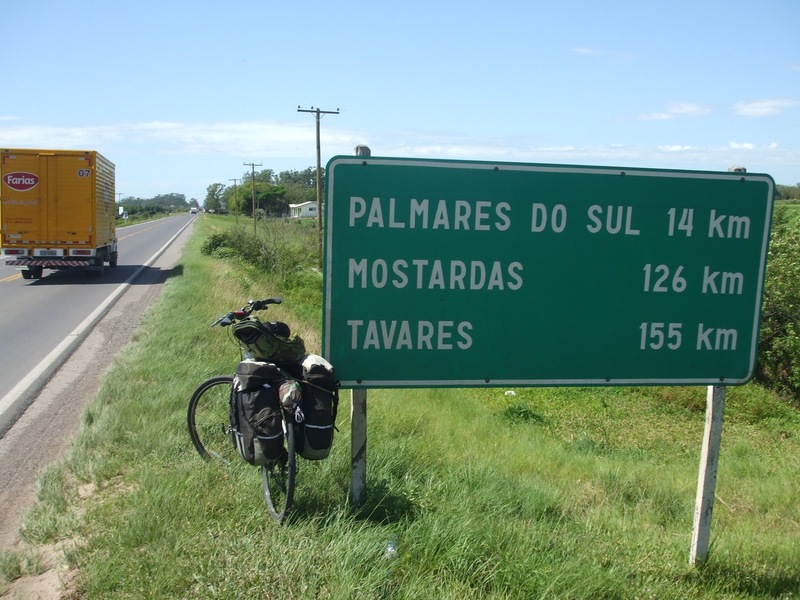 Pelotas is the second city of Rio Grande do Sul, and it took a few miles to ride into it. Once I got into the built up area, I encountered more stinking cobblestones. I turned this way and that, and finally found a paved street, which I followed towards downtown. Downtown was a ways off, and, once again, my odometer headed toward 80 miles for the day. When I finally got downtown, it took a while to find a hotel, where I chained the bike to a pipe in the parking garage. Once again, 81 miles ridden on the day. Properly bathed (I sweat so much, I leave salt streaks in my T-shirt. ), and with sun screen removed, I went down stairs and cleared up one of my doubts at reception. It turns out that the border town of Jaguarao does indeed have a Policia Federal presence, so I can get my exit stamp in my passport there, instead of doing it here in Pelotas. Since I have no idea where the PF is in Pelotas, that will save me some time. Tomorrow I face my longest ride yet, 90 miles or so to the Uruguayan border at Jaguarao/Rio Branco. According to the weather forecast, I should have winds blowing out of the east, which will help me as I will be riding southwest. Here I am in Porto Alegre, again. This morning, I was all ready to head out, and, when I went to re-attach my saddlebags (panniers), the left saddlebag fell apart. The two hooks that attach it to the luggage rack on the rear of my bike ripped out, and I was left holding them, some fabric, and looking at my saddlebag looking up at me from the floor, where it had fallen. In disgust, I went downstairs and told them to hold my room for me. So, it was back to the bike store, where I bought a new pair of Brazilian made bags for 200 Reais, and then returned to the hotel where I spent literally several hours trying to make them compatible for my bike and luggage rack. They are not made for an American luggage rack, but, luckily, I had a number of bungees and about 30 feet of Parachue Cord with me, so I was able to improvise. Unfortunately, by the time I did all this, it was well past noon, so, here I am. Stuck in Porto Alegre. I cannot imagine anything else going wrong, so I assume I will be on my way tomorrow. Once I got the bicycle sorted out, I went out and about on foot. My hotel is off a street called Rua dos Andradas, which, where I am, is a pedestrian shopping area, closed to vehicular traffic. This is great, because it means you can wander around looking at things without worrying about getting run over. I found out, once I got walking, that on Saturdays, the authorities close a number of other, surrounding, streets as well. I walked through all of them, was astonished at the prices being asked for TVs and electronic devices, and eventually came to a newspaper stand that was selling El Pais, the Montevideo newspaper. So, I bought a copy of it and a copy of Zero, then went and got a Coke and some French rolls, and went and sat in the park for an hour reading the papers. Reading the financial page of Zero was interesting; the Brazilian Central Bank is worried about the economy overheating, causing inflation and the development of a property bubble. (Sound familiar?) The simple way to fix this is to raise interest rates. However, real interest rates are already astronomical, and raising them higher would cause the Real to appreciate and the Dollar to fall, which would provoke a revolution amongst the Brazilian export sector. At the Real´s present value, they are having a hard time. So, the Central Bank is trying to avoid this by leaving rates alone, and raising reserve requirements, which will make it harder to GET credit. We shall see if this works. I have a feeling that the end result is that private sector interest rates are going to rise anyway. Meanwhile, El Pais had an article claiming that the Uruguayan Central Bank has sold a boatload of Pesos, trying to keep the dollar above U$20 to one. There exporters will have the same problems Brazil has if the Peso appreciates more. I also discovered that renting a nice house this summer at the beach in Punta del Este could cost as much as $5,000 Dollars a day. Wow. In my wanderings, I discovered several McDonalds. Each had a line at the counter 20 or more people long, none had tables available. I am not about to travel 5,000 miles to eat at McDonalds, but I poked my head in to see the prices. About 50% more expensive than the US. I also, riding to and from the bike store, found several Subways, and saw an ad for the Outback Steakhouse. Going to southern Brazil for Australian steak would be like, I guess, going to Australia for Brazilian Churrasco. What is the point? Tomorrow I, hopefully, move on. Greetings, again, from Porto Alegre. This is an interesting city, and I like it here. Yesterday evening, I went walking looking for somewhere to eat, and found something that could, if I do not discipline myself, cost me a LOT of money. The Brazilian Army´s historical section has a bookstore here. I went in, presented myself as a former NCO in the US Army (which I am, if you count the National Guard.) and spent quite a bit of time looking around. They had books on the Paraguayan war, Brazil´s participation in the Second World War, the 1964 military coup, and the modern Brazilian military. I ended up buying one and only one book, and got out of there. I could have spent several hundred dollars with no problem at all, and then would have had to Fedex everything home. Leaving the bookstore, I went and got a pizza and, finally, did not get mistaken for an Argentine. They asked me if I was Uruguayan (¨You speak with a Spanish accent...¨); I guess I am now close enough to the border that more Uruguayans than Argies make it up this way. This morning, I went on the hotel´s computer and used google.com.br to get a map and directions (of the same high quality you can get for American addresses) to the bike shop, which, according to its web page, opened at 9:30. It was a distance of two and a half miles from my hotel, and I got there, after riding (with no rear brake...) through positively suicidal morning traffic, at 9:25. At 9:30, nothing. 9:45, nothing. I started to get uptight. At 9:50, I heard noises behind the closed metal doors, and a few minutes later, they finally opened. I took my bike in, explained its defects, and they promised to fix it and have it ready at 5PM. I then walked back to my hotel, passing through the beautiful Parque dos Moinhos de Vento (windmill park), which looks like a much larger Lafayette Park in Washington, DC, and went and had lunch. I then wandered through the municipal market, which was jumping, and bought Zero Hora! and a Coke and went and sat for a while in another little park reading the paper. 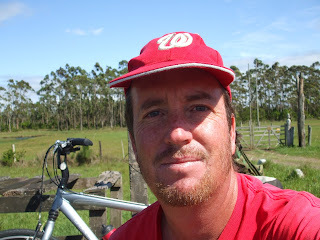 At about 4:15, I headed back to the bike shop, stopping along the way at a Bradesco ATM to replenish my funds. At exactly 5PM, I was back. My bicycle had had the following done to it. One new spoke was installed. The front and rear brake shoes were replaced. The rear derailleur had been adjusted; I had been having trouble shifting up from lower gears to higher gears. My baggage rack, which had started to bend on one side, was unbent. The bike was significantly cleaner. All of this cost me R$51, which, at the prevailing exchange rate, works out to a few pennies less than US$30. It would have cost well over a hundred bucks in San Diego, and I would probably have had to leave the bike overnight. If you are ever riding a bike in Brazil, Bike Tech in Porto Alegre ( www.biketech-rs.com.br) is the place for you to visit. I then road my bike back, through equally insane traffic, and parked it in my hotel room, where I was happy to see that my cloths had been washed and left on my bed. My riding gloves had become so sweaty that they would not dry overnight, and were starting to stink. As I was rolling up my clothes (To save space, I take a T-shirt, lay it out on the bed, place a pair of underpants and socks in the center, double it over, and then roll it up.) I encountered something interesting. I found a 5¢ coin, dated 1994. Big deal, you say. It is. I believe that this is the first time since before the Second World War that 16 year old coins are circulating in Brazil. The pre-1994 inflation ate up the value of money so fast that, for example, in 1993 when I was here there were NO coins at all in circulation, only lower value banknotes worth pennies that had been worth $20 or $30 dollars a year before. This is a sign of how far Brazil has progressed. Tomorrow, my plan is to head south on my old friend BR-116 towards Pelotas, which should take two days. I will then decide where to go from there. Greetings from a place I did not plan to visit. I am in Porto Alegre (population 1.5 million), the capital of the State of Rio Grande do Sul. Today started off very well, I left my hotel in Balneario Pinhal at about 9AM this morning, stopped for my usual Cokes and waters, and headed east on RS-040, at KM Post 94. 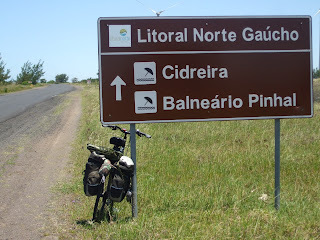 I was headed east 20 miles to a little town called Capivari do Sul, which was the crossroads with RS-101, which would take me south to the little town of Mostardas (which would have entailed a 100 mile ride today.) and then on to Sao Jose do Norte and the Ferry to Rio Grande tomorrow. I had a favorable wind, and the day was very nice. 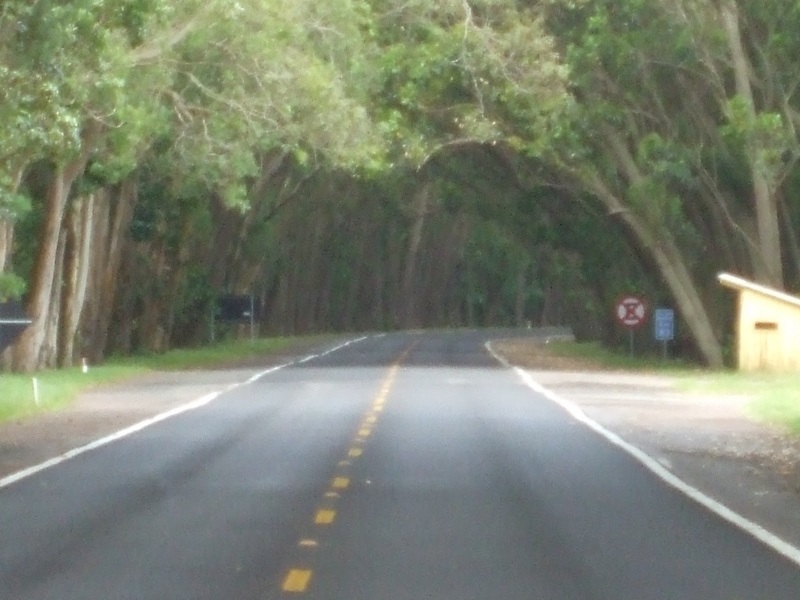 About ten miles out of town, I came to an are called ¨Distrito do Tunel Verde¨, or Green Tunnel. For two miles, it was exactly like I was riding through a green tunnel. The trees came out over the road, you could not see the sky, and the wind dropped to nothing. It was like riding up 36th St. in Washington, DC in the summer time. Very beautiful. Exiting the green tunnel, I rode along a few more miles and came to Capivari do Sul where I made a left turn onto 101 and commenced to head south, past a sign informing me that Mostardas was 126 kilometers away. I was not worried about the distance because I had a wind blowing out of the north and east, and I was going to be heading south and west. Eight miles south of Capivari do Sul is a little town on my map called Palmares do Sul, where I thought to stock up on half a dozen bottles of water for what would probably be a long way between services. 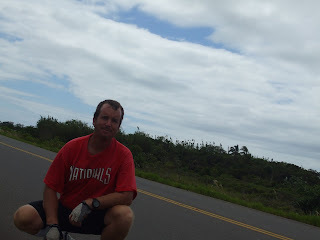 I rode south happily for about three miles when a truck coming in the opposite direction blew my baseball cap off. Disgusted, I slammed on the brakes to go back and get it and heard a ¨Snap" from my rear wheel. I got the cap, and then stopped to inspect, and discovered the absolute worst possible thing that could have happened. I had snapped off a spoke. 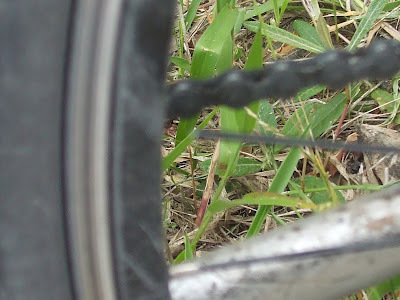 Those of you who read my writings about my 2006 trip up the Blue Ridge Parkway will remember my battles with broken spokes on that trip. In 2006, the spokes kept breaking off near the axle of the wheel. Today, it snapped off at the rim. I used my cutting plyers and cut the loose spoke off, and debated what to do. I decided that I would return to Capivari do Sul, which I had not even entered (I thought), having bypassed it to the east, get a hotel room, and then hunt up a bike mechanic, and continue on my way tomorrow. Since the rear wheel, lacking a spoke, no longer spun true, it was hitting up against the brake pad (Such brake pad as was left, anyway) on each revolution. So, I undid the rear brake, turned around, and rode the three miles back to Capivari. At which point, I discovered that the road crossing I had taken south WAS Capivari. One gas station, no hotel, no bike mechanic, no nothing. I also discovered that I was now at KM post 62 out of Porto Alegre. I headed out through level farming country (Farming and cattle raising are the backbone of Rio Grande do Sul´s very prosperous economy.) and made good time. When I had to stop or slow down, I used the front brake. As I rode inland, it got progressively hotter and more humid. Eventually, it started to rain, so I stopped, put on my windbreaker, and started to cook. The rain did not last, so I pulled into a gas station for more Coke and took it off. Some hours later, I rode through a toll plaza, and found myself at KM 13, on the outskirts of an armpit called Viamao. Here the urban area began to build up, and I started hitting stop lights. No problem, I told myself, it´s only eight miles to go. Unfortunately, I eventually came to KM 0, and was still in Viamao. How irritating. RS-040 turned into Avenida Bento Gonçalves, and I had another ten mile ride into downtown Porto Alegre (Past the ¨Bourbon Shopping Center¨, I am not kidding.) Once I got downtown, I rode around for another three or four miles before I found two hotels. The first one rejected me because they did not want to deal with my bike, they said. The fact that I looked like a pirate, with a very burned face, covered with sweat, including salt streaks all over my black T-Shirt, and with sun-screen smeared on my face, may have had something to do with it. Idiots. I went to the hotel 100 feet further down the street, and got a very nice (and cheaper) air conditioned room. Using the internet at this place, I have found a place that claims to service Trek bicycles to take my bike tomorrow, and, if they appear competent, I am going to also have them replace the brakes and give the bike a tune up. I paid my hotel until Saturday, hopefully they can fix things by then. When my bike gets fixed, three options occur to me. 1.) I can take a bus back to Capivari do Sul, and continue my planned route. 2.) 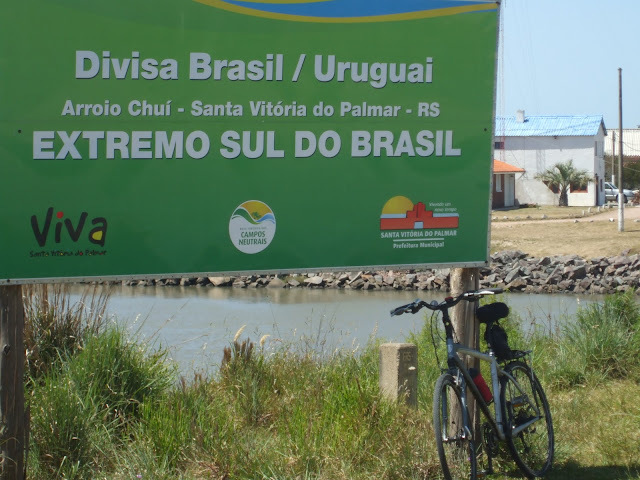 I can ride south from Porto Alegre to Pelotas on BR-116, and then continue on either to Chui/Chuy or Jaguarao/Rio Branco, both at different places on the Uruguayan border, or 3.) Take the bus to Santana do Livramento/Rivera, and ride down Route 5 325 miles through the center of Uruguay from Rivera to Montevideo. I will mediate upon various weather forecasts and wind directions tomorrow before deciding what to do. Greetings from the beach, where it is beautiful. 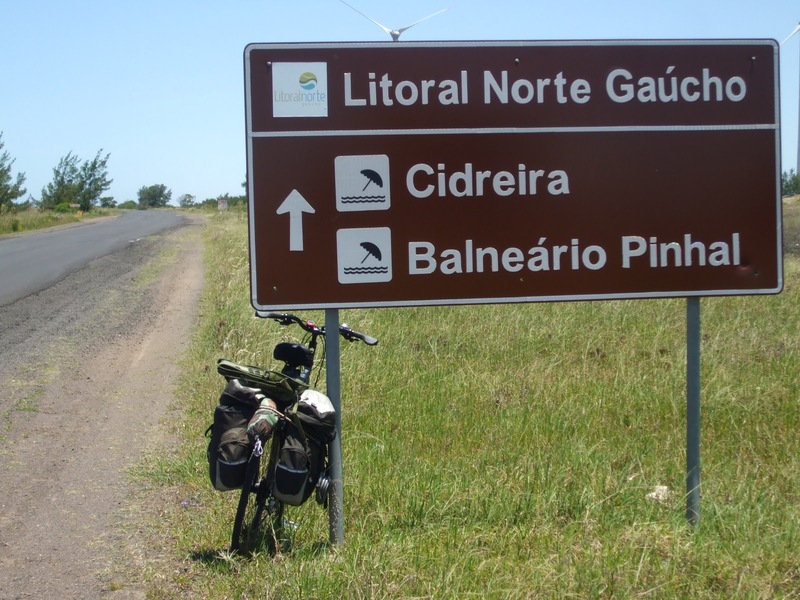 I had a fairly favorable (out of the east) wind today, and rode 61 miles down from Arroio do Sal. When I left my hotel this morning, the owner, who I did not see yesterday, mentioned that he had been driving down from Torres yesterday and saw me pedaling along. I felt like saying, ¨you dirty rotten so and so, it was windy and I was dying, why didn´t you pick me up?¨ Ah well, he was quite interested in my trip, and ended up not charging me for the two Pepsis I drank out of the room´s frigobar, so I guess I cannot complain. He also handed me four apples to take with me, which I ate and greatly appreciated en route.Greetings from the beach, where it is beautiful. I had a fairly favorable (out of the east) wind today, and rode 61 miles down from Arroio do Sal. When I left my hotel this morning, the owner, who I did not see yesterday, mentioned that he had been driving down from Torres yesterday and saw me pedaling along. I felt like saying, ¨you dirty rotten so and so, it was windy and I was dying, why didn´t you pick me up?¨ Ah well, he was quite interested in my trip, and ended up not charging me for the two Pepsis I drank out of the room´s frigobar, so I guess I cannot complain. He also handed me four apples to take with me, which I ate and greatly appreciated en route. Taking my leave, I then headed south and, due to the way the land curves, west. This meant that the easterly wind blowing (strongly) helped me along, and I kept up a steady 15 MPH most of the day. 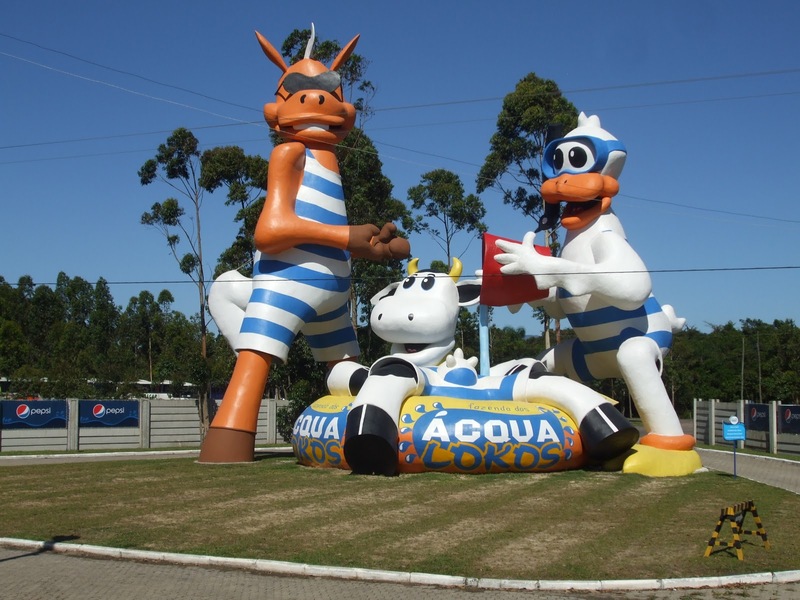 About 18 miles south of Arroio do Sal, I came to the large resort of Capao da Canoa; a few miles before, I passed an enormous water park called Acqua Locos. At 10AM on a school day, the place was absolutely jumping. I continued on past a little resort town called Xangri-La, had five or six miles of country side, and then came to another large resort town called Tramandai. Tramandai is a straight shot, 60 miles, by freeway to Porto Alegre, and is very large. I rode through town, and on the west side got on to RS 786. Since I had gone west, 786 headed back east for a bit, and I got the full affect of the wind in my face. I figured, however, that if I kept going east, I would get wet, so at some point I HAD to turn south, and, sure enough, the road did just that. 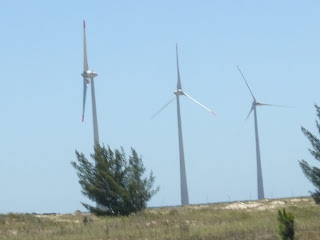 I rode through five or six miles of tiny towns, came to a huge wind-mill farm that is under construction, (They will not lack for wind in this area...) and then rode along the beach in solitude for ten miles or so before coming to the town of Cidreira. I was starting to feel my time in the bike saddle, but I decided to continue on a bit more, and in another eight miles came to Balneario Pinhal. Riding into town, I found, again, most of the hotels to be closed, since the ¨season¨ has not started yet. I found one open one, got a room, and then went out to walk the beach and get something to eat. Greetings from the little beach town of Arroio do Sal, which is about 20 miles south of Torres. Today I encountered some absolutely monstrous headwinds, in the 20 to 25 MPH range, coming straight out of the south. As I was heading south, it felt like someone was pushing my against my chest, which sure slowed everything down. I headed out of Torres, went about a mile and a half east, then turned south on to RS-389, known as the ¨Estrada do Mar¨ (Coast Highway). Immediately, the wind hit me. 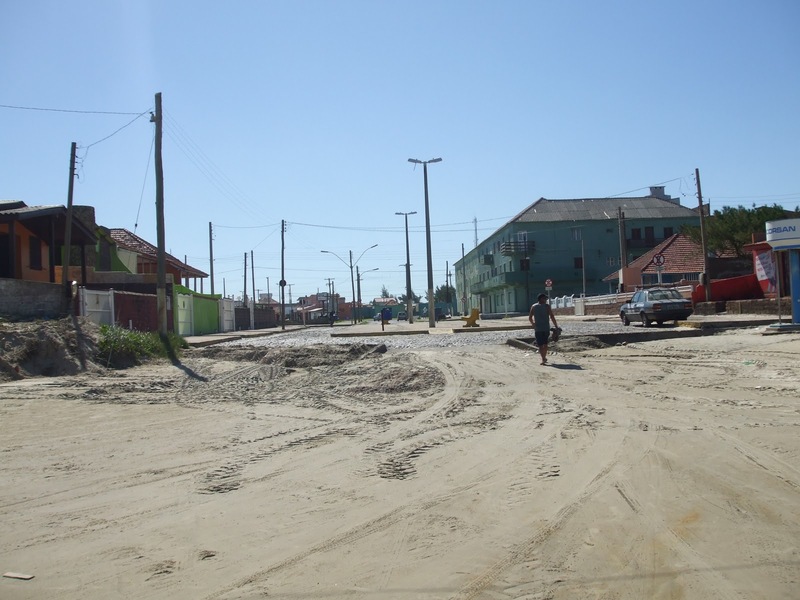 Almost three hours (and one Coke and three bottles of water) later, I had only moved 20 miles, and was faced with a choice: Either take the cut-off for Arroio do Sal, or continue on another 20 miles to Capao da Canoa, a slightly larger resort. I decided to bin it, and cut into Arroio do Sal. The 20 miles on 389 were quite pretty, off to my right (west), I could see the coast range (known as the ¨Brazilian Escarpment¨ that I had descended out of a few days ago. To my left were fields; 389 is far enough inland that the ocean was out of sight. Once I got off of 389, I rode a couple of miles into town, found half a dozen hotels, five of which had signs saying that they would open for the season in mid December, and was very happy to discover that the sixth was open. I got a room, locked my bicycle to a pole in the garage, and, on my way back through the office with my clothes and things, discovered Zero Hora!, the principal Porto Alegre newspaper that is my favorite of all Brazilian papers. Zero, as it is known, is so right wing it makes Limbaugh and friends look like wimpy flip-floppers. I appropriated it, and as I was basically exhausted from fighting the wind, lay on the sofa in my room for an hour reading it. It had an interesting, and long, article on the WikiLeaks situation; apparently the Brazilian government has been cooperating a LOT more than they have admitted to, and the reason that ¨no terrorists have been operating in Brazil¨ is that every time the Policia Federal nabs, say, a Hezbollah operator in the triple border region, they charge him with drug trafficking or something, and do not classify it as terrorism. This lets the government say one thing for public consumption and do something very different. Whether this will cause any problems for the government or not remains to be seen; Lula is out of office next month anyway. Once done reading the paper, I went walking along the beach for a while, and almost got my face sandblasted off by the wind. So much for that. I then went to a cafeteria and ordered beef with rice and french fries, and got a HUGE bowl of rice, another of fries, and a large piece of meat, all for less then ten bucks. I am now going to go back to the hotel and see if I can borrow a bucket, hose and a towel and wash off my bicycle, two weeks of travel have left it pretty dirty. Tomorrow´s weather forecast calls for 10 to 20 MPH winds blowing east to west, and since I will be going south and west, this should help to get a little farther than I did today. Greetings from Torres, where I was treated to an illuminative lightening storm last night, and it has continued raining on and off all day today. Luckily, it is supposed to be sunny and in the 80s for the rest of the week. Today was relaxing, and it was nice to be off the bike for the day. This morning, I got a piece of very good news. I wandered down town with my map to the tourist office, and talked to the very nice girl inside for a while. She informed me that, contrary to what my map shows, BR-101 is paved all the way to Sao Jose do Norte, AND there is ferry service from Sao Jose to Rio Grande, AND I should be able to find a bottom-end hotel in Mostardas or Tavares, halfway down the peninsula. It is about 225 miles from here to Sao Jose do Norte, and I should be able to do that in three days, if the wind is right. Assuming it stops raining, I will be on my way tomorrow. On another happy note, since this is a major tourist spot, I actually found a money exchange place this morning, and was able to exchange $340 at R$1.70 to one. That should, with luck, be enough to get me out of Brazil, and means I am not carrying so much cash around with me. Next to the money exchange place, I bought the local paper (for 75¢), and walked to the beach where I found a little place that sold me a Coke and a ¨pastelzinho¨, which is what the Brazilians call empanadas. Looking through the paper, I found a little one paragraph piece on a ¨truck accident¨ Sunday morning on BR-101 in Santa Catarina, near the municipio of Ararangua. The paper reported that one of the drivers died, which, considering the shape of the cab I saw, and the PRF cop´s reaction, surprised me not a bit. Too bad for him. I then walked all the way to the end of the 3,200 meter boardwalk, and came to the Rio Mampituba, which is the border with Santa Catarina. On the other side was Paso de Torres. I then walked back to the hotel, got my book and read for a while, and, taking advantage of another break in the rain, got out my bike and rode around through town. To my immense disgust, I discovered a bridge over the Mampituba, which led into Paso de Torres. Had I known that such a bridge existed (it does NOT appear on my map), I would have ridden into Paso de Torres yesterday, and gotten off the BR-101 a few miles early. I then found another bridge, made of rope and for pedestrians only, and walked the bike back across it. I got back to the hotel shortly before the skies opened up again. I also went to three pharmacies this morning, and stood on three different scales (In case one was wrong.) All of them showed me, dressed in shorts and tennis shoes, to weigh 90 kilos, which is 198 pounds. When I weighed myself at home, the morning before my last day at school, I weighed (sans shorts and shoes) 208 pounds. Take into account the clothes, and I have lost just about 12 pounds over the last two weeks. It is amazing what the combination of lots of exercise, eating right, and not drinking any beer can do to one´s weight. Jerry Bourbon is a former soldier who is presently living in Tijuana, Mexico and teaching in San Diego, California. He has lived and travelled in Mexico, Brazil and throughout South America for the last 30 years.